In case you ever wondered about the what, why and how of slip and skid resistance testing, we put this article together to help you understand. Why are floors and other surfaces tested? In public spaces and places of work, it is the responsibility of the owner or facility manager to ensure that environments used by the public or workforce are as risk free as possible. For example, if an employee were to spill perhaps a litre of olive oil in a kitchen without immediately cleaning up the mess, or at least making sure that the area was cordoned off and the spill resulted in another employee slipping and seriously hurting themselves, the former may well be considered negligent, perhaps sacked or disciplined in another way. The same is true of the company or person responsible for workplaces or public spaces. The most important part of keeping a premises safe is knowledge. Knowing whether or not your floors are slippery and potentially hazardous is the first step. If they are, the next step is to minimise the hazard and then subsequently test periodically to ensure the surface is kept as hazard free as possible. In the event of an accident, failure to carry out this duty of care to workers and/or the public can result in costly litigation. This is the primary reason for testing: Ensuring surfaces have safe levels of traction in normal use. What types of surface can be tested? Slip resistance testing is about making surfaces safe for people, so generally speaking if it is a continuous surface and can be walked upon, it can and should be tested. Part of our work involves testing bath tubs and shower trays in hotels and we often treat these with our patented NS21 formula which greatly increases friction with no visible alteration to the appearance of the bathroom furniture. You can find out more about our non-slip floor and surface treatment services here. The primary method for testing the traction qualities, or, the skid resistance of any given surface, is the pendulum test. 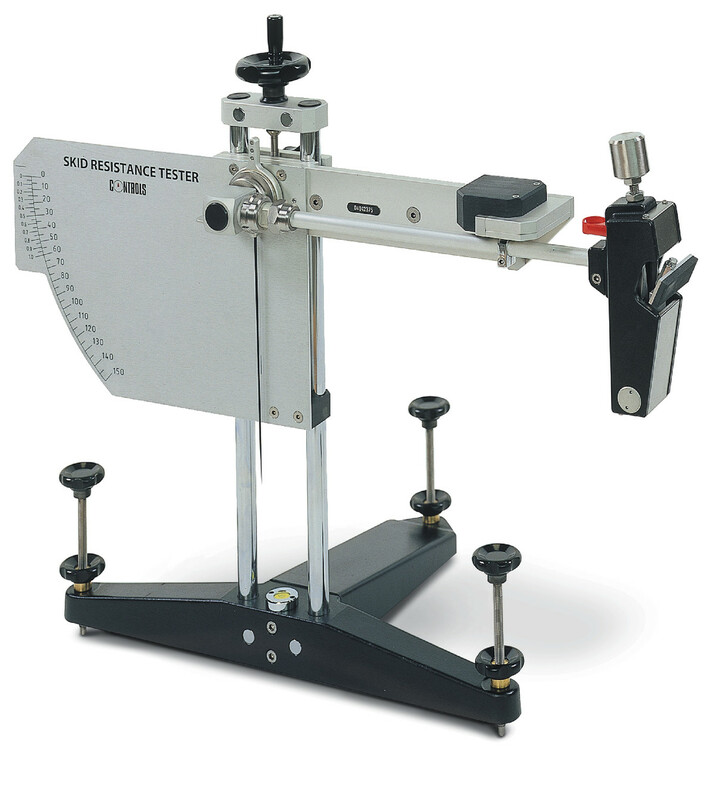 The pendulum test is the preferred method of both the HSA in Ireland and the HSE and the UKSRG (UK Slip Resistance Group) in the UK. It is designed to simulate the action of a slipping foot and can be used both on site or in the laboratory. Standards for the Pendulum include BS 7976 (used for pedestrian surfaces) EN 1341 (for external paving) and EN 14231 (Natural stone modular tiles). The testing tool itself is pictured below. One of our primary service offerings is slip and skid resistance testing. The slip resistance tests can be supported by sophisticated roughness and surface profile analysis, and by expert consultation, including expert witness for legal cases. There is a duty of care upon flooring designers, manufacturers, distributors, installers, contractors, and on the architects who specify flooring products, to ensure that flooring surfaces are 'fit for purpose' and do not pose a safety risk. One of the key components of safety is defining how slippery the floor is; this is known as its 'slip resistance'. In fact, The Safety, Health & Welfare at Work (General Application) Regulations 2007 stipulate that floors must not be slippery so that they put people's safety at risk. It is this pendulum test that holds up in a court of law - if your floor has been tested using any other method then the results will not stand up in court. Safety Direct Group are a leading provider of testing for slip resistance, offering both the Pendulum Test and the Tortus Test. We also offer a full on-site consultancy service regarding skid and slip issues. Testing of floors and surfaces in situ can identify a significant number of factors that can influence the skid slip performance of flooring materials. For example, cleaning regimes, maintenance, integrity of substrate, wearing or weathering of the flooring surface, presence of any sealants on the surface of the floor and trafficking pattern can all affect significantly the performance of flooring materials.